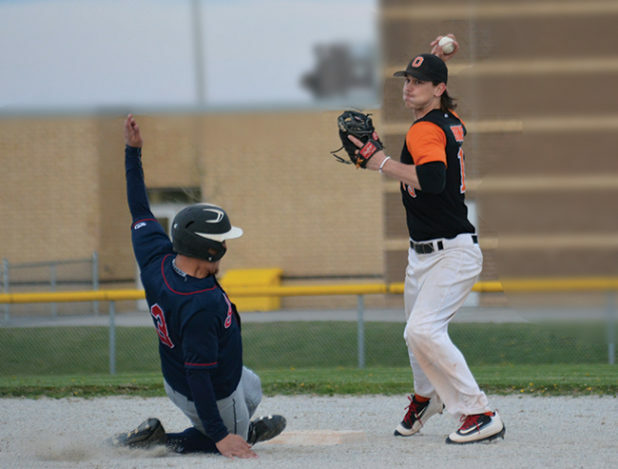 The Orangeville Giants moved into an early lead in the North Dufferin Baseball League standings with a 6-3 win over the Midland Indians at Princess of Wales Park in Orangeville on Friday (May 19) night. The Giants are now in first place in the League standings with a 4-0 record.The Clearview Orioles and Lisle Astros are close behind with both teams sporting a 3-0 record so far for the season. So far this seasons the Giants have turned out a solid defensive effort while producing some big numbers on the offence. The squad went the distance last year going up against the New Lowell Knights in the championships series. This year they have a fully loaded line-up and have their sites on capturing the title. Friday night’s game got off to a good start in the first inning beginning with a single from Darius Barlas. Josh Hickey followed up with a hit to shallow left field that drove in the opening run. After a hit-less third inning that saw the side retire on three fly balls, the Giants got the bats moving in the later innings and recorded five more runs to win the game 6-3. The win gives the O-ville squad a 4-0 record to start the season. Their season got underway on May 6, with a 12-1 win over the Mansfield Cubs and a 9-3 win on May 16, over the Alliston Athletics. There are 15 returning teams in the senior NDBL line-up this season. The Giants will be in Lisle on Friday, May 26, to take on the Astros. They return to Orangeville Sunday, May 28, to host Barrie Angels at Springbook Park.